Magic Jack will make sure your party goes with a bang! Your guests leave with a smile and your child is the star of the show. His incredible shows are packed full of fun, laughter and interaction with the children to take them on an exhilarating and exciting magical journey which promises to make yours, a party to remember! More than just a Magician, Jack is a balloonist, a comic and even an animal tamer - though sometimes he can't quite control Reggie the Rabbit, Denzil the Dragon and Cecil the Crazy Bird. They have been know to cause him all kinds of trouble! 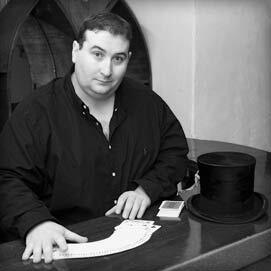 What's more, Magic Jack is trustworthy, dependable and has over ten years experience as a children's entertainer across the North East of England. Close-up magician Chris Cowl is based in the North East of England and has been specialising in the performance of magic for about a decade. His success has been founded on performing strong original magic and unique sleight of hand, ITS MODERN AND MIND BLOWING. He has been performing Close-up magic for thousands of guests all over the place, and guess what............ he totally loves it. He doesn't pull rabbits out of hats or do big illusions with beautiful women (although he wouldn't mind)....he does things with everyday objects i.e, playing cards, coins, elastic bands, watches, basically anything he lays his hands on. You can book Chris the Close-up Magician for your wedding, university ball, charity event, formal dinner, award ceremony, house party, engagement, anniversary, birthday, christening, or basically anything you want, who needs an excuse. PLEASE NOTE: FOR CHARITY EVENTS CHRIS OFFERS A 20% DISCOUNT! Children love Mr Windbags and his unique Magic Shows because they feature Comedy, jaw-dropping feats of Magic, amazing Balloon Modelling and lots of audience participation. As a professional entertainer Mr W has also developed a fantastic Birthday Party Package which adds music, original party games & prizes to the mix. Log on to www.mrwindbags.co.uk to find out how to make your child's party unforgettable! Close up magician performing in the Durham area and beyond. Ideal adult entertainment for any occasion. "Adam entertained our wedding guests, 170 of them, all evening! A true professional genius with a sense of occasion. He even went the extra mile to present us with a special memento for our 1st anniversary. Satisfaction and amazement guaranteed." Imagine objects appearing and disappearing in your own hands, cards changing places in the blink of an eye, your fondest memories being read from your mind, newspaper cuttings turning into £10 notes or your thoughts being predicted by someone you've never met before. Imagine all of these things, and more, and you have my close up magic.